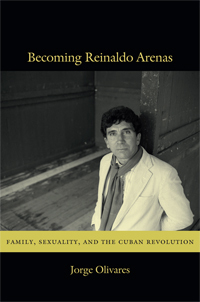 New from Duke University Press is a book by Jorge Olivares (Allen Family Professor of Latin American Literature at Colby College), Becoming Reinaldo Arenas: Family, Sexuality, and the Cuban Revolution. Description: Becoming Reinaldo Arenas explores the life and work of the Cuban writer Reinaldo Arenas (1943–1990), who emerged on the Latin American cultural scene in the 1960s and quickly achieved literary fame. Yet as a political dissident and an openly gay man, Arenas also experienced discrimination and persecution; he produced much of his work amid political controversy and precarious living conditions. In 1980, having survived ostracism and incarceration in Cuba, he arrived in the United States during the Mariel boatlift. Ten years later, after struggling with poverty and AIDS in New York, Arenas committed suicide. Through insightful close readings of a selection of Arenas’s works, including unpublished manuscripts and correspondence, Olivares examines the writer’s personal, political, and artistic trajectory, focusing on his portrayals of family, sexuality, exile, and nostalgia. He documents Arenas’s critical engagement with cultural and political developments in revolutionary Cuba and investigates the ways in which Arenas challenged literary and national norms. Olivares’s analysis shows how Arenas drew on his life experiences to offer revealing perspectives on the Cuban Revolution, the struggles of Cuban exiles, and the politics of sexuality. Jorge Olivares, the Allen Family Professor of Latin American Literature, has been teaching at Colby College since 1982. He is also the author of La novela decadente en Venezuela (Caracas: Armitano, 1984) and articles in journals such as Colby Quarterly, Contemporary Literature, Hispanic Review, Hispanófila, MLN, Nueva Revista de Filología Hispánica, PMLA, Revista Canadiense de Estudios Hispánicos, Revista de Estudios Hispánicos, Revista Hispánica Moderna, Romance Notes, and Symposium. Reblogueó esto en DE LA HABANA HA VENIDO UN BARCO CARGADO DE….